In communities across the United States, volunteer and professional firefighters stand at the ready, to apply highly specialized training and education in life saving capacities. 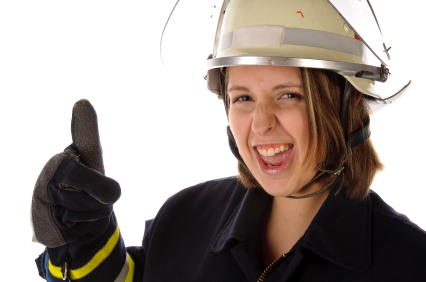 Classroom and practical learning are paramount to success in careers that require split-second action, like law-enforcement and fire fighting. Vocational schooling, as well as advanced degrees in areas like fire services administration, provide career opportunities for would-be firefighters – but not without a price. College costs for firefighters are on par with other technical vocations, especially when bachelor’s degrees are sought. As a result, one of the most celebrated service careers a student can aspire to translates into a wealth of scholarship potential. Because the service is essential in every locale, firefighting scholarships originate from a wide cross-section of funding sources. State and Local Governments hold a large stake in municipal fire services, so they participate in educational initiatives that ensure a steady-stream of well-trained firefighters. The respected career also garners scholarship attention from trade groups like firefighters associations and foundations. These organizations operate from central, national committees that grant educational funding, but local chapters of industry organizations are also rich with scholarship opportunities for firefighter education. Individual colleges and technical schools administer campus-specific scholarships to support their academic programs. Firefighting careers range in scope from rank-and-file service members, to administrators and other related professionals. Scholarship opportunities are available at all levels of education. Fire services education leads to diverse employment, in areas like emergency medical services, rescue, wild-lands fire services management, hazardous materials control, ship-board fire management, dispatching and fire prevention education. The International Association of Fire Fighters (IAFF) provides labor union support for professional firefighter/members. The AFL-CIO organization funds several scholarships for members and their children, most of which are labor-minded. For example, The Harvard Trade Union Program Scholarship underwrites labor education for student members. IAFF’s Howie McClennan Scholarship provides general scholarship dollars for dependent children of firefighters-union members who lost their lives while serving. The National Fallen Firefighters Foundation sponsors post-secondary education scholarships for children, spouses, life-partners, and stepchildren of firefighters who are honored at the Fallen Firefighters Memorial. To qualify for the Sarbanes Scholarships, children of fallen heroes must be under 30 years of age, and must not have been older than 22 at the time of their parents’ death. Candidates are reviewed and selected based on academic performance, community and volunteer activities, and extracurricular participation. Graduates and high school seniors are invited to apply for the awards, which require two letters of recommendation. Fire Rescue Med Scholarships provide funding for registration, fees and accommodations, to attend the industry’s most important event. Ten awards are distributed to worthy recipients annually. Company Officer Professional Development Scholarships are issued by the IAFC Foundation, to provide for students wishing to attend the Company Officer Leadership Symposium. Scholarship winners receive the cost of registration and personal stipends. IAFC Foundation Higher Education Scholarships enable firefighters to evolve with the ever-changing landscape of providing fire services. Science and technology are on the cutting-edge of firefighting, so students use IAFC funding to stay educated about best-practices and emerging firefighting protocols. Harvard Fire Executive Fellowship provides senior officers with the opportunity to attend Harvard’s program for state and local officials. The Cumberland Valley Volunteer Firemen’s Association offers the J. R. Haines Memorial Scholarship for members who are enrolling in degree programs related to fire science. Awards are valued at up to $1,000 each. The Ocean City Volunteer Fire Department, in Maryland, sponsors the F. Michael Sacca Scholarship; in memory of one of their own. The awards are worth $1,000 to each recipient. Successful applicants are committed to the field of firefighting, and enrolled in Fire Science degree programs at colleges and universities. The Illinois Fire Chiefs Association sponsors generous scholarships for Illinois firefighters returning to higher education to complete degree or certification programs. Awards are valued as high as $2,000 each, and candidates earn them based on professional motivation and financial need. A 250 word essay is submitted by each applicant, stating professional ambitions and outlining the importance of continuing education. The South Carolina Firefighters Association provides scholarships for members pursuing further certifications or degrees that advance their understanding of modern firefighting protocols and equipment. Nebraska State Volunteer Firefighter’s Association provides valuable funding options, including up to $4,00 worth of annual tuition reimbursement. Participation in the program requires a service commitment, which can be served during the time scholarships are received,or during a period following graduation. NSVF Fire Chief’s Association provides training options and scholarships for Nebraska firefighters. Individual fire departments – even those from relatively small towns – provide scholarship relief for college students enrolled in firefighter programs. City firemen’s association scholarships are made possible by endowments, fund-raising efforts and donations from fire department supporters. For example; the City of Fond du Lac Fire Department, in Wisconsin, offers Josh Polhamus Scholarships for worthy high school graduates transitioning into fire science and related academic programs.